Its the period in the season when the various sports groups tend to gather to acknowledge the performers of the past season and it was the turn of Athletics Ireland on Thursday to gather for their awards occasion . 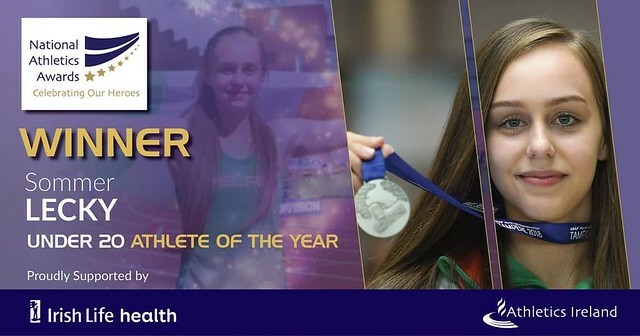 As anticipated Finn Valley athlete Sommer Lecky received the outstanding national u 20 gong for what was a brilliant season culminating in a world silver high jump medal 1.90m a Donegal record and national junior record . a truly outstanding global performance . Her coach in recent years NIall Wilkinson received a coaching award deservedly so for the tremendous contribution and learning he has brought to the environment. . Brendan Boyce who competes in the Irish 30k championship at St Annes Park, Raheny this Saturday had been nominated for the endurance award won by Alex Wright 20k walker . Sunday morning the Donegal youth squad came together at Finn Valley led by Mark Connolly organised by Co. coaching officer Mary O Callaghan reporting appositive training learning period.